The colourful and scenic old German quarter is the best shopping area along Zhongshan Lu (Lu=street) which is both the main shopping and commercial area. If it is clothing that you are looking for Zhongshan Lu, along with the Longshan Underground Market close to the Xinhaoshan park are your best bet. 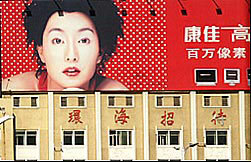 Two department stores are Qingdao Friendship Store - 12 Xinjing Lu and Qingdao Department Store - 51 Zhongshan Lu.